This 23-year-old US woman’s story of survival has been dubbed nothing short of miraculous. 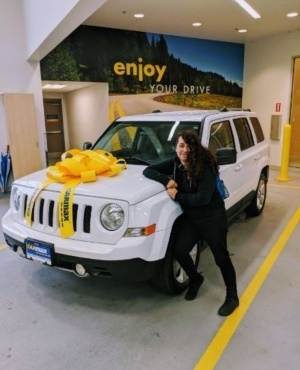 Angela Hernandez, a musician from Oregon, had been driving to her sister’s home in Lancaster near Los Angeles on 6 July when a small animal crossed in front of her, causing her to swerve and lose control of her car. According to a CNN report, her white Jeep veered off the edge of a cliff and crashed about 76 metres below, where the ocean meets a rocky beach that’s largely isolated from those driving above it. Earlier that fateful Friday Angela was spotted on surveillance camera in her vehicle at a petrol station near Carmel, California, and her family only became concerned when they couldn’t reach her later that afternoon. According to Monterey county sheriff Steve Bernal, rescue crews had searched the area – where Angela was eventually discovered – and found no obvious signs that a car had driven off the cliff, reports Daily Mail. The heavy fog which descended on the Californian coast may have made it more difficult for first responders to spot her and the wreckage, John Thornburg, spokesperson for the sheriff's office, told The Washington Post. After a week the family had all but given up – their beloved Angela had disappeared without a trace. But seven days after her mysterious disappearance – on 13 June – news broke that she’d been found on a remote Californian beach by a couple hiking in the area. Two days after her miraculous rescue Angela took to Facebook to give an account of the harrowing seven days she spent waiting on the remote beach to be rescued. She recalled that her car’s windows were rolled up. Once the window was broken she jumped into the water and swam until she reached the shore, she added. Then she passed out, but she doesn’t know for how long. “When I woke up, it was still daylight and it was only then that I’d finally realised what had happened,” she wrote. According to Angela, the next few days were a blur. Angela began feeling the effects of dehydration about three days after the crash, she said in the post. “By this point the back of my jeans were torn apart, my socks were nothing but holes,” she wrote. She went back to her car to salvage her belongings and found a radiator hose that she kept in her pocket. She used the hose to siphon fresh water dripping down the moss on the cliffs from a natural spring, sheriff Steve Bernal, told CNN after the rescue had been made. That person – or people – turned out to be Chelsea Moore (34) and her husband Chad (31) of Morro Bay, California. The pair were camping above an ocean-side cliff in the rugged Big Sur area of Monterey County. They decided to climb down a cliff to a remote beach to find some good surfing and fishing spots, according to TIME. “We’re avid beachcombers. We get excited about sea glass and abalone shells,” Chelsea said. Instead they came upon a car bumper and a short time later spotted a rusty and wrecked Jeep, so the couple took the license plate to show authorities. Chelsea says that they both agreed that there weren’t survivors, but walked further along the beach just in case. After walking almost 500m they heard a cry for help, and then another. Then they saw Angela. A disorientated Angela had two black eyes and burst blood vessels in her eyes. Hours later rescuers were able to take Angela back up the cliff and fly her via helicopter to a hospital. Doctors later informed Angela that she suffered a brain haemorrhage in the first few days of her crash. She also had four fractured ribs, a collapsed lung, broken blood vessels in both eyes, a fractured collar bone and intense sunburn to her hands, feet and face. She says, despite her injuries the experience has given her a life-changing perspective. “I don’t know, you guys, life is incredible,” she concluded.